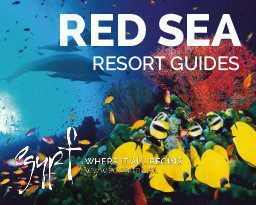 THE RED SEAD HAS MORE THAN 1200 fish and 300 coral species. The renowned Coral Triangle in the Pacific Ocean boasts 2228 fish and 605 corals. I mentioned this comparison to underwater photographer David Doubilet of National Geographic. I always think this answer sums up the Red Sea perfectly. With the variety of reefs and islands that sit astride the Tropic of Cancer in southern Egypt, you should always expect the unexpected. I co-owned one of the few dive-centres in Sharm in the 1980s, so it’s only natural that I pine a little for the old days –the adventurous spirit, the desperado dive-crews, the gentle, laid-back Bedouins, the vast empty Egyptian desert landscapes, uncrowded dive-sites and untouched wrecks. SINAI IN THOSE DAYS was a military zone that buffered mainland Egypt with Israel after the Six Days War, and was returned to the Egyptians after the Camp David agreement of 1981. With excellent weather year-round, it became something of a magnet for adventurers, dive-bums, beach hedonists and hippies. So where can you find the equivalent these days? 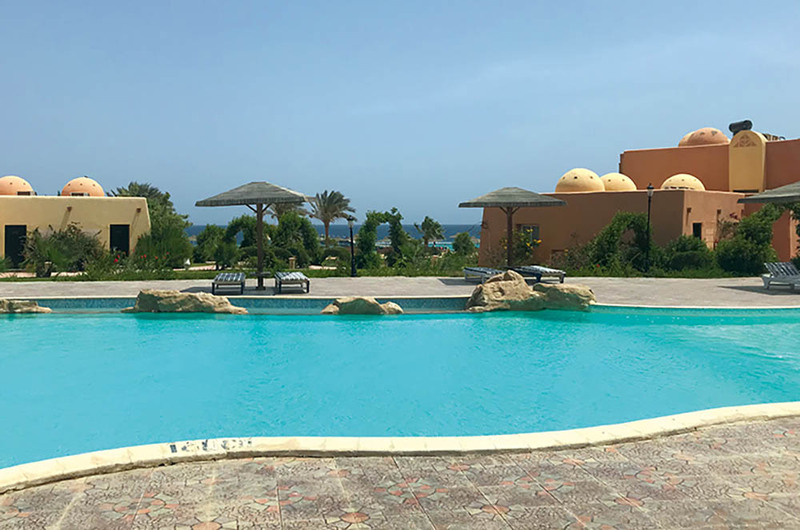 This April I took a one-way Thomas Cook flight to Marsa Alam, hoping that over a couple of months I might discover the same qualities that Sharm and Sinai offered all those years ago, retained in the deep south of Egypt towards the Sudan border. I didn’t book ahead, just packed a 30kg dive-bag and camera. I assumed that Zabargad and Rocky Island would still be there, sitting on the Tropic of Cancer at 23°N, 35°E. I had visited these islands countless times on our charters with Colona 2 and Colona IV in the 1980s and ’90s, enjoying the plunging walls, shoaling hammerheads, inquisitive silvertips and silkys, sometimes aggressive grey reefs and engaging oceanic whitetips. 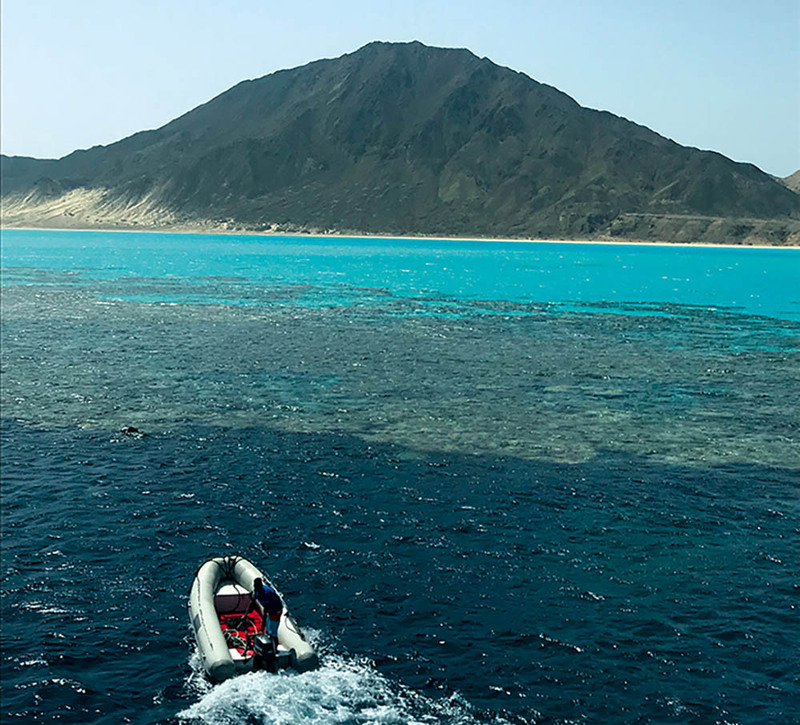 The sunlight bringing out the colours of pristine corals, including huge forests of gorgonians, and the breathtaking turquoises and blues of Zabargad Island lagoon, had beggared belief. Would these coral reefs have been protected by their remoteness? I STARTED MY JOURNEY at the new man-made marina lagoon at Port Ghalib, south of Marsa Alam international airport. It wasn’t too busy, but busy enough for holiday-makers happy to escape Europe’s lingering winter blues. I checked in to the Marina Lodge Hotel, where Emperor Divers is based, its fleet day-boats moored on the jetty directly in front of the hotel. It’s a professional operation visiting local but fairly indifferent sites on fringing reef beside the shoreline and coastal reef table, particularly good for trainee divers and, if you’re lucky, you might bump into a dugong grazing on the seagrass, or see the huge green turtles at Marsa Mubarak or Ras Shona. At Ras El Torfa, I even had six bottlenose dolphins swim in from behind me at speed, almost within touching distance, their eyes firmly fixed on some mission up the coast. 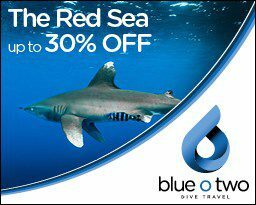 What a welcome back to the Red Sea I thought – expect the unexpected! General Manager Luke Atkinson told me about Emperor’s “Deep South” liveaboard itinerary to St John’s reefs, with occasional visits to Zabargad and Rocky Island, so this became my back-up plan, should all else fail down south. In the meantime he suggested I head the 100 miles or so south to Hamata. It sounded like my kind of quiet location, away from the maddening riviera crowds with only a few resorts, diver- and snorkeller-focused, and day-trips out to the vast reef complex of Fury Shoal. Then I bumped into Christof Clausen from Orca Dive Club, who told me he was travelling down to its dive-centre at the Wadi Lahmy Azur Resort in Hamata. He said I was welcome to hitch a ride and check it out. We set off the next morning, south along the coast with its kaleidoscope of desert and reef colours on the road to Port Bernice and the Sudan border. Christof shared the history of the area’s development along the way, and made a pit-stop at the entrance to the huge Wadi el Gemal National Park. The last time I had travelled this road had been around 1990, when there had been no airport and no hotels, only the odd Bedouin beach-hut and scattered mangroves. We passed a number of unfinished hotels, awaiting the next instalment of cash should there be an upturn in the Egyptian economy. An election was due within weeks, and there were giant pictures of President Sisi everywhere. Christof seemed upbeat about Egypt’s future and felt that things were finally beginning to improve for its 100 million people. There had been only 65 million when I had worked there only a generation ago! WE PASSED HAMATA’S PORT with its handful of boats and rolled into the 4* resort, which seemed nicely empty (from a guest’s point of view). There was a short jetty across the reef table directly in front of the dive-centre allowing snorkellers and all dive levels to visit the house reef, where I was told Spanish dancer nudibranchs were frequently sighted. We jumped in that afternoon and there was plenty to enjoy. It was a classic Red Sea scene, with the ocean right on the doorstep and no hassle reaching the fringing reef. Come evening the hotel was suddenly full, and an excellent selection of tasty food was served to the mainly German families. Relaxed and friendly Orca Dive Club, managed by Alaa with dive instructors Hazem and Gondel, made an ideal base. For the next two weeks I made daily trips out to Fury Shoal, with its choice of 35 reefs and islands. Close to shore and a short distance from Hamata Port are the Siyul Islands, a picture-perfect cluster of sandy coral islands. The backdrop of coastal mountain range and western sunsets made for photogenic stopovers between the dives. 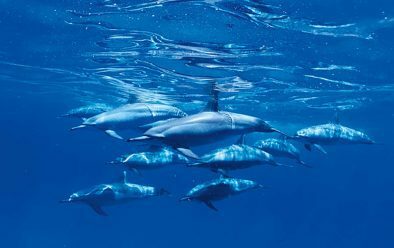 Sha’ab Sataya or Dolphin reef, with its resident pod of spinner dolphins, is the must-do dive on the outer easterly reefs, where we regularly saw around 50 dolphins and sometimes many more. It was a popular run, but you are only allowed to swim and snorkel with them, and quite rightly not to touch them. They swam in methodical circles in the safety of the inner lagoon, quietly sleeping and resting from their open-water hunting and feeding escapades. Sha’ab Malahi, Abu Galawa and Claudio reefs offered enormous temple-like hard-coral formations, in superb condition, with huge caves and swim-throughs providing excellent variety and excitement. Finally, Sha’ab Maksur, the most easterly reef, provided glimpses of pelagic fish: tuna, grey reef and resident whitetip sharks and a manta ray. Soft corals were prolific on the two vertical pillar columns on the southern plateau, making it different from the other hard-coral structures of the Fury Shoal reefs. FOR NON-DIVERS and something a little different on land, you can head to the biggest camel market in north Africa. It’s a day trip from Hamata down to Shalateen, in the Halayeb triangle of Egypt and Sudan. You’ll find a tribal mix of local nomadic Bedouin, descendants of ancient Nubians and even some Rastas from Ethiopia, buying and selling camels and spices, a real desert experience. Port Bernice, 30 miles further south from Hamata, is unfortunately closed to tourists at the moment, though there are plans to convert the military airport into a civilian one. Construction, reportedly underway, would promise the opening up of the Ras Banas region and the Elba National Park, an exciting prospect for divers, making the St John’s reefs accessible by day-boat. Tourists might also be allowed to travel the 220 miles directly west to Aswan and Upper Egypt. Hamata, the resort and the dive-centre, with 10-20 divers per day, didn’t disappoint, and did remind me of Sharm and nearby Na’ama Bay in the 1980s. 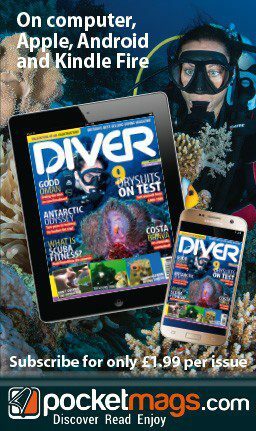 For me, it’s the best-quality coral-reef daily diving relatively close to the UK. But Zabargad, Rocky Island and St John’s were calling, so I returned to Port Ghalib only to head south again with Emperor. I was sceptical, however. I had never been on a liveaboard with as many as 26 divers before! In the old days, we would host six to 10, so this would be a new experience. Emperor Elite turned out to be a serious bit of kit. At 38m, it was big and spacious, with four decks to get lost in and a vast saloon and dining room, comfortable en suite cabins, an excellent dive-deck layout and stern platform and two RIBs to sweep you in and out of the water. The crew of 10 busied themselves effortlessly throughout the week, safely mooring up and serving delicious food under the quiet direction of the very experienced Captain Mohammed. One of the great qualities of being a single diver is that you can very quickly make friends with fellow-divers from around the globe. Briefings were by divemasters Hany and Amr, and Hany’s were pretty much the best I had ever heard. Someone was always in charge, helping everyone to get the best out of each dive, whether they wanted to follow a guide or do their own thing in buddy-pairs. AFTER THE CASUAL check-out dive at Abu Dabab, we sailed overnight to the St John’s system of around a dozen reefs and shoals. Over the course of two weekly charters, we dived Habili Ali, Gota Soraya, Dangerous, Gota Kebir, Umm Aruk, Abu Basala, Paradise and St John’s Caves. All were first-class and diverse, including reef tables and vertical walls, with sandy plateaus usually with multiple huge vertical coral pillars and table corals. Spinner dolphins at Sataya reef, Fury Shoal. Where the current hit the reef, there was also a chance to see big stuff: mantas, oceanic whitetip, grey reef and resident whitetip sharks, shoaling barracuda, tuna, snapper and trevally. The soft corals hung bright and beautiful from the hard coral walls, and you couldn’t avoid that Red Sea trademark, the humming layer of bright red anthias, millions of them. The plateaus were filled with blue-spotted rays, scorpionfish, moray eels, lionfish, clownfish and anemones, Picasso triggerfish, sweetlips and bannerfish. St John’s Cave was a beaut! Guided in single file, watching our buoyancy and fins, we slipped through a 60-minute dive in awe of the labyrinth that weaved its way through the reef table to the lagoon and back again. Glassfish, sweepers and exquisitely coloured small hard-coral branches and cup corals packed the deep corners and roofs of the caves. It was time for Zabargad and Rocky Island, my ultimate mission, 20 miles from the Sudan border and pretty much slap on the Tropic of Cancer. We dived at Rocky Island first, with its huge cathedral-like walls, stunning light and clear blue waters. A pod of some 50 dolphins greeted us as we moored up. We took the RIB before breakfast to the northerly point and dropped to 40m in superb all-round vis. It was that definitively awesome, neutrally buoyant underwater experience, though no hammerheads this time, only glimpses of grey reef sharks. We drifted back towards the boat in the current, passing through huge gorgonians and black and whip corals, with an abundance of healthy soft corals and marine life. It felt wonderful to be back. After a second dive we headed to Zabargad, similar to the north’s Tiran Island in size but far more remote and less visited. Only one other boat was present. An excellent drift-dive out to the easterly point revealed beautiful table corals in the shallows. Blue-spotted rays and moray eels seemed to litter the reef. Finally it was time to head north. Passing close to Ras Banas point, we could see the military posts and Bedouin camps dotted along the peninsula. We dived our way through Fury Shoal again, then sailed overnight to Elphinstone Reef, which I had last visited some 20 years before. 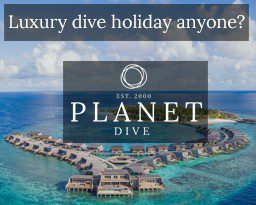 Elphinstone has become highly rated among divers, with its oceanic whitetip and other big shark sightings and gorgeous reef. I was struck by the number of day-boats moored on the reef, even RIBS from local dive-centres, which surely must be an exhausting, bumpy ride out for divers to endure. SMBs are essential. Nevertheless, Elphinstone worked its magic and served up two excellent dives along the north and south plateaus, drifting along the sunlit easterly wall. Again, we had only glimpses of sharks, although towards the end, low on air, a lone oceanic whitetip circled in the blue. Back onboard the newer divers, some with GoPros, excitedly compared their first close encounter with a real shark, laughing about how they were down to 50 bar and trying to get back onboard as it had circled closer and closer, and they had realised they were in the hunting zone of a big predator! Hany and Amr had, of course, steered them back to safety. OPEN-WATER SHARKS require total respect, and I’ve seen 4m tiger sharks off Elphinstone in the past. 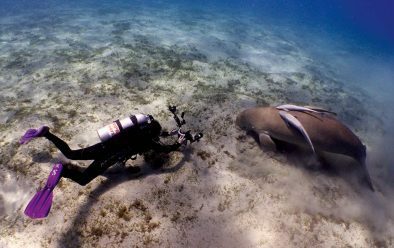 Snorkellers and swimmers especially do need to be aware – earlier this year, close to Marsa Alam, a swimmer was bitten and died off a beach jetty. Such attacks are extremely rare, but it’s sensible never to swim alone in these waters or at dawn or dusk. I believe that in southern Egypt, as in so many parts of the world, open-water reefs are being over-fished, depleting stocks, disrupting the food-chain and forcing pelagic predators to come closer to the shore to hunt. In my opinion, a fishery-management plan would help to protect the reefs and eco-system and reduce the chances of such attacks happening in the future. However, the fact that we were seeing sharks at all was a good sign! Our wind-down dive was in the peaceful setting of Marsa Shouna. We jumped in before the day-boats arrived and in the seagrass encountered a dugong munching away, oblivious to our presence and allowing everyone to take pictures – from a respectful distance, of course! They are bizarre creatures. We came across half-a-dozen huge green turtles too, making this a remarkable last dive. 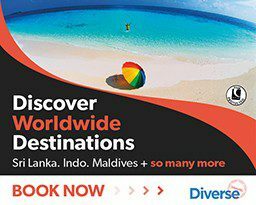 Marsa Alam is only a five-and-a-half-hour budget flight away – far cheaper to reach than some of those Coral Triangle destinations I mentioned earlier. And if Port Bernice airport does open soon, the spectacular coral reefs and islands around the Tropic of Cancer, as pristine and adventurous as I remember, will be within even easier reach. GETTING THERE> Fly from the UK to Marsa Alam. WHEN TO GO> The resorts are open year-round, but the summer is very hot, so spring, autumn and winter are perhaps the best times to visit. PRICES> Return flights from £220. Lahmy Azur Resort from 50 euros full-board per room per night (two sharing). Orca boat-dives from 30 euros. Emperor Elite from £750pp for a week on Deep South and St John’s itinerary. Marina Lodge Hotel from £60 full-board per room per night (two sharing)..